www.iahta.org - Indonesia as a maritime country, clearly has a lot of natural wealth. However, all marine resources in Indonesia, yet maximal and optimal management. A very simple example is the natural wealth of the sea water itself. Although Indonesia is Indonesia is a maritime country, but still there are people who get mumps, the disease occurs due to lack yodium.walaupun not much. Iodine itself is usually found in the salt content. Therefore, in this occasion we will discuss in simple pure making salt from sea water. 1. If you do not have land or a place to make and want to make it at the beach, then the first thing to do is clean up the beach to be used to make salt from the trash, say there was trash around the beach area. 2. If we have a place or the land will be used to make the salt have required first is to make a barrel of sand and blame one corner we leave a hole for the sea water is through distillation stage. 3. After all the media are ready, then step is to enter the sea water beriktnya slowly into the barrel of sea sand. Then, the desalination of sea sand vat is collected in a bucket. 4. The next step is to pour water into this distillery but long shaped box, but the length of the box can be adjusted to our liking, distilled water and then we pour it into a box with a depth of 1 segment telunjuk.hal serve water to dry quickly when it dries. 5. Then, after water is poured, then the final stage of drying in the scorching rays matahari.Dalam this drying process, the water will evaporate and the water level is low because evaporates, leaving room grains - grains of pure salt is ready for harvest. 6. The latter is to collect grains - grains of salt, to be further processed for use in accordance with our needs. 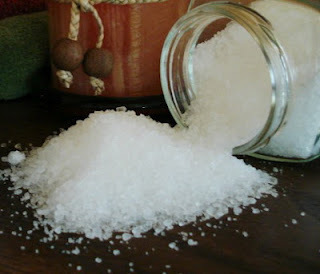 Thus a brief overview of the process of making a simple salt. Easy - hopefully pleasing and rewarding.